The primary mandate of GVTA is to acquire and maintain trails in the Grand River watershed. Consider joining us and partaking in trail maintenance! Upcoming Trail Maintenance : Check back later for details of upcoming trail maintenance days. 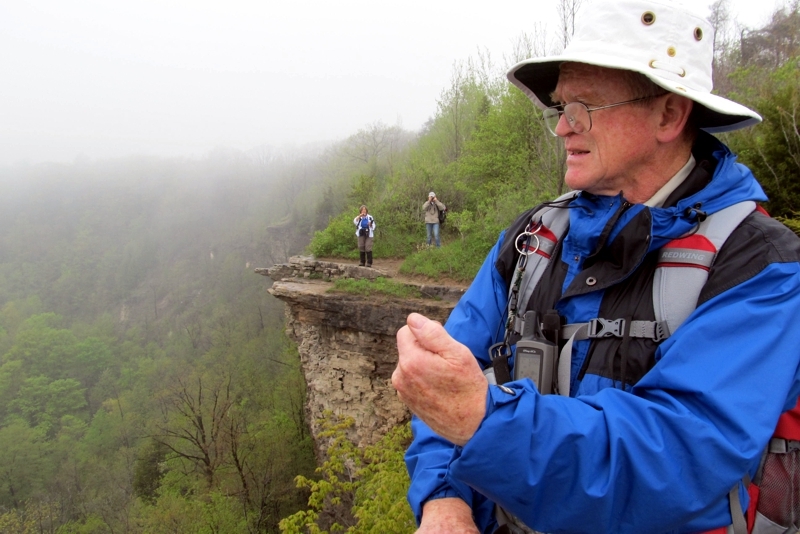 Click here to see Hike Leader Training information. We welcome anyone intertested in any volunteer position. In particular we have the following Open Positions. You could become a Trail Captain ! A Trail Captain is assigned a section of the trail to maintain. The section may be upwards of 5 km in length. Your task would be to check the trail conditions at least twice a year and to complete a Trail Report form that is submitted to one of four Trail Directors. In addition, a Trail Captain would perform routine maintenance especially during the growing season. Weed whacking, grass cutting and branch trimming are some examples of routine maintenance. Also, refreshing blazes is another important task. Such routine trail maintenance should be done by the Trail Captain and another volunteer or hiking friend, rather than alone. Larger tasks such as the installation of a footbridge, box culvert, side logging or stile, would normally be arranged and performed by a team consisting of the Trail Captain, Trail Director and other volunteers. As an example, in the spring of 2007 a GVTA work crew built a 26-foot bridge over Idlewood Creek in Kitchener. This task is only one of many types of maintenance done by volunteers. Appearing to the left is a picture of the Idelwood Creek bridge building in its early stages. At this time the main trail is divided into four sections each one with a Trail Director (for the divisions, please see the list of Board of Directors). If you are interested in trail maintenance in any capacity, do not hesitate to contact us. A relatively new Strategic Plan has, as one of its primary goals, the development of another section so the main trail would lead from the Belwood Lake area up to Luther Marsh. The implementation of this task will take time and is in the capable hands of Andrew, Trail Director, Pinnacle Section. Especially if you live in Wellington and Dufferin Counties and are interested in helping Andrew, please contact him.